It’s always tricky to prioritize decorating dollars, and I tend to funnel most of mine to interior improvements: furniture, fabric, tchotchkes. But lately I’ve been thinking that the outside of the house – and especially my front entry – deserves its share of the love. The entry may be the first impression of a home, and my entry is best described as mousy. 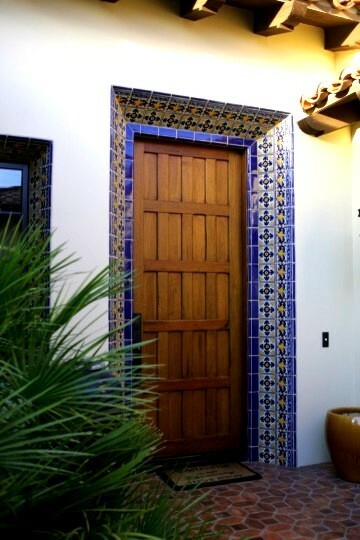 Fortunately, jazzing up a front entrance doesn’t have to cost a fortune. 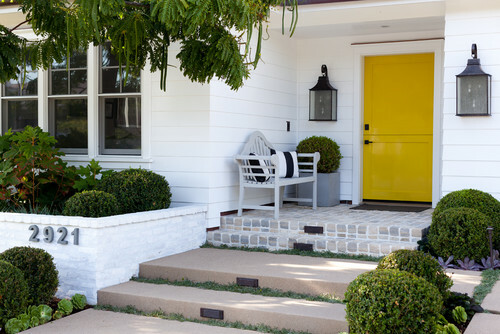 Try these eight strategies to create a showstopper entryway without blowing your budget. 1. Create a mini room. 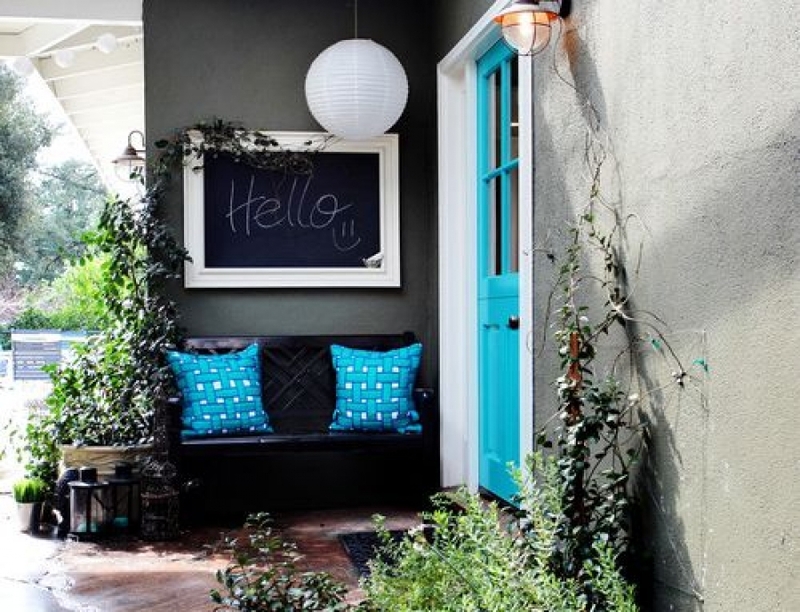 Here a bench with cheery outdoor pillows, a hanging paper lantern and a framed chalkboard combine to turn a plain entrance into a sitting space all its own – all without breaking the bank. Mix and match furniture to suit your home’s architecture and style. 2. Spell out a welcome. A stencil, a can of spray paint and presto! A plain concrete stoop turns into a hospitable howdy. 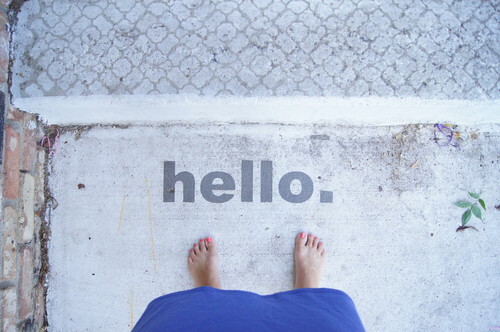 If you can’t or don’t want to paint directly on the surface, try stenciling a plain cotton or sisal doormat instead. 3. Invest in showstopping hardware. 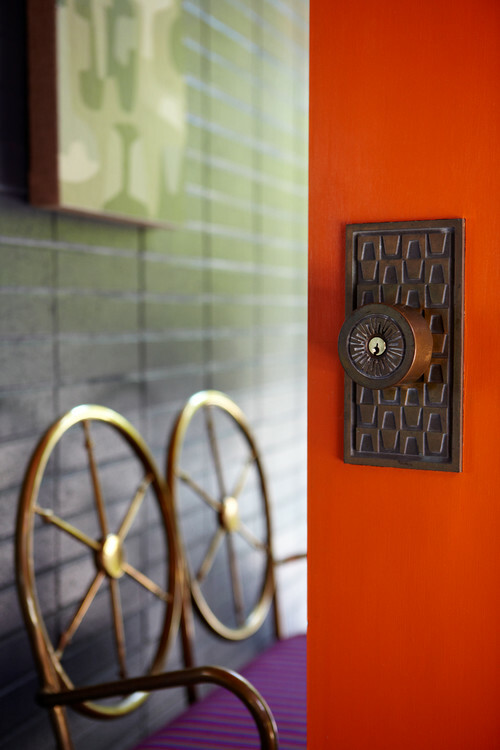 Swap out bland doorknobs and knockers for instant pizzazz on the cheap. You can search flea markets and architectural salvage stores for one-of-a-kind vintage models, but even home centers carry eye-catching styles these days. Choose a knocker that offers a glimpse into your personality and interior style, whether it’s an equestrian motif for horse lovers or a nautical theme for a house on the coast. 4. Pile up plantings. Plants are one of the easiest and most affordable ways to give your entrance a polished look, and they can enhance any effect you’re going for. 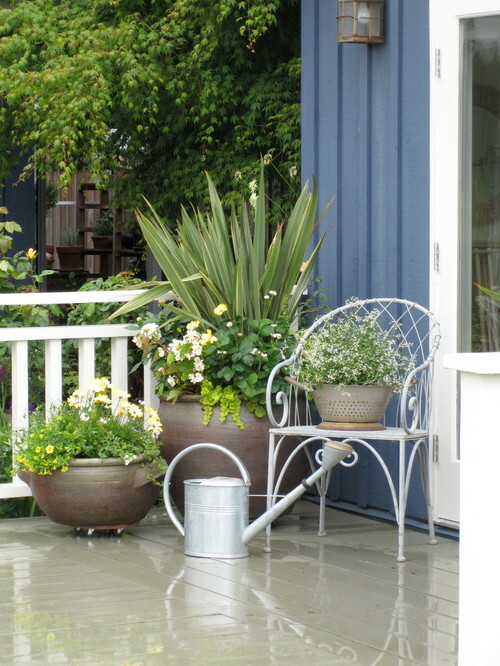 Mass tumbles of old-fashioned blooms in weathered tin or tole tubs for a cottage; stick with variegated greens and sleek containers in a modern setting. For a traditional house, create a symmetrical grouping of palms, ficus or roses in ceramic or terra-cotta planters. 5. Light the way. 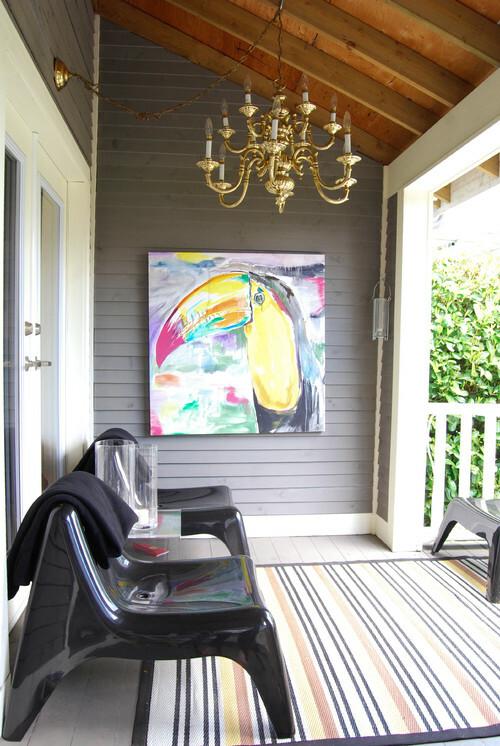 Why settle for a boring outdoor light fixture when you can hang a piece of eye candy? Outdoor chandeliers are delightfully unexpected. If you want to use it for illumination, look for a model that’s designed for outdoor use, but if you just want the decorative effect, you can mount an indoor fixture without wiring it. Choose a shade that contrasts strongly with the primary paint color: bright pink paired with pale gray siding, turquoise against rusty red brick, plum on khaki stucco. Lipstick red in a field of crisp white is a classic, but branch out and try other colors – perhaps kelly green or Chinese yellow. 8. Have fun with house numbers. 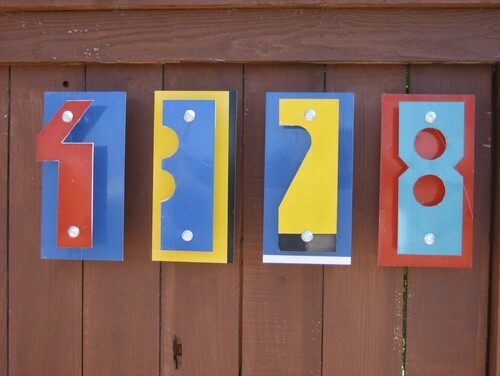 Forget hardware-store numbers on the mailbox. Make yours pop: fun colors, funky fonts, creative placement. Just be sure that you don’t sacrifice clear visibility and readability for the sake of visual interest.